Suisun Valley is a rural K-8 designated agriculture science school of approximately 520 students that has a reputation for being a small nurturing school with an instructionally demanding environment. 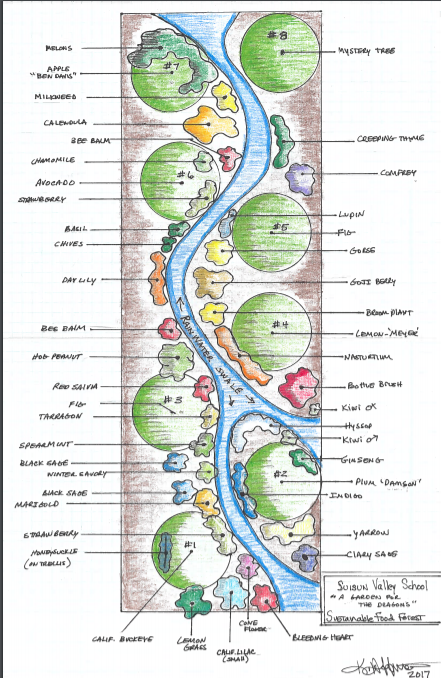 Suisun Valley has a California Native plant garden, is collecting rainwater above ground and has raised beds and nitrogen fixing fava beans in their curriculum. Sustainable Solano partnered with the school in 2017 to install a demonstration food forest complete with a swale. 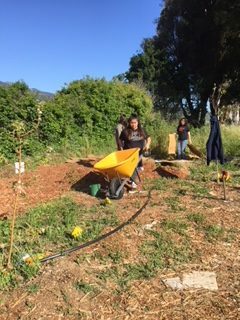 Kathleen, Larry and Elena taught a hands-on swale workshop to the Suisun Valley eighth graders in the spring of 2017 on how to use swales to store rainwater in the ground. Garden coordinator, Laura Klein worked with the children to lay in the foundation of the garden (dig the swale and add wood chips to build the soil). Principal Jas Wright recognized the importance of including the children in the whole process. Each 6th through 8th grade classes was assigned a tree guild to design, install and maintain. Program manager, Nicole Newell went to the school and taught the children about selecting plants with multiple functions (attract beneficial insects, pollinators, nitrogen fixers and nutrient accumulators). The teachers and students then did the research and selected a tree and the surrounding plants. Five students from each 6th-8th grade class planted the guilds over three busy days. The future vision is the continued success of each guild with a focus on creating awareness of permaculture that can be carried forward each year to involve all of the students. Laura Klein, the garden coordinator works with each class to research the functions of the thriving plants in the garden and the students will continue to add plants to this evolving garden. As with any garden, some plants don’t thrive. This creates an opportunity for the students to investigate the reasons behind the problem and look for solutions. See a gallery of Suisun Valley Elementary photos here.